At the beginning of his turn, Ma Dai can flip a judgement card then select any character within his physical range. 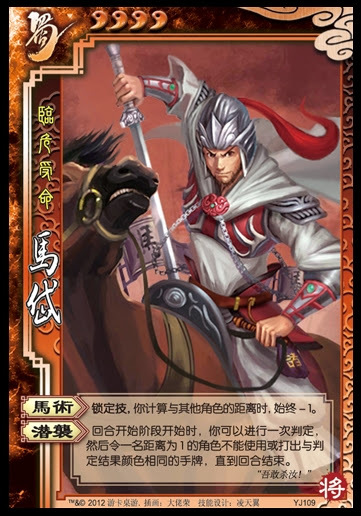 The target cannot use cards of that color for the rest of Ma Dai's turn. Ma Dai always has a -1 bonus. When New Ma Dai performs "Sneak Attack," he flips a judgement card before choosing his target. New Ma Dai's "Sneak Attack" does not work in the most recent version of QSanGuoSha. Since we cannot use New Ma Dai's "Sneak Attack," it is impossible to test New Ma Dai's usability as a character. The new "Sneak Attack" seems to be very similar to Ma Chao's "Iron Cavalry." Since all Escapes are red, he can prevent an enemy from using an Escape on one of his Attacks. He has the benefit of knowing before he uses the Attack, but the ability only works on characters in his physical range. We predict that New Ma Dai will be about as useful as the original Ma Dai, but we would like to note that we hope that this new version was not created due to some uninformed belief that the original version was overpowered. We believe that most San Guo Sha players that complain about the original version must not have played many games using him. There are situations in which the original "Sneak Attack" is very powerful, but more often than not, he seems to be the weak link on his team.